While out gardening one day Lion comes across an injured bird and so takes it home and nurses it back to health. 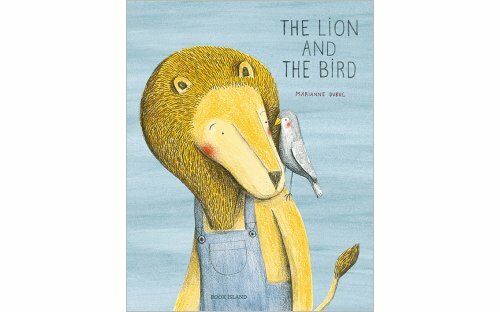 Lion and Bird are completely different but their friendship blossoms and they do everything together. They spend time sharing stories and enjoying time outdoors but soon bird has to return to his flock. Throughout the story we move through the seasons exploring the heights of friendship and the pangs of loneliness. 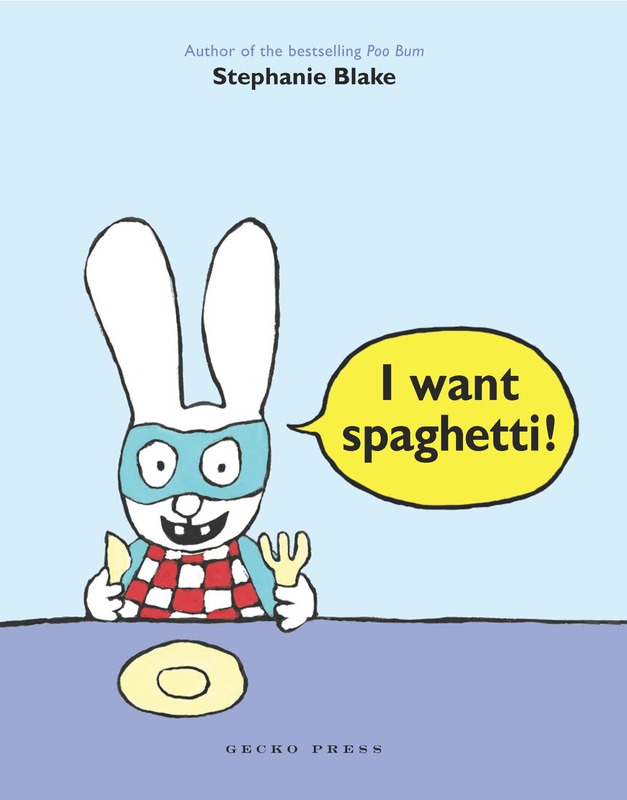 It is a sparsely written book allowing the illustrations to do the talking. It allows us to see the characters and feel the depths of their friendship. By the same token it also lets us see Lion at his most vulnerable and loneliest of times. This is an honest and very special beautifully packaged hardback picture book. This is not just for young children but a reminder to us all of how special friendships are and how much loyalty matters. This gentle story pulls at the heart strings but friendship and loyalty are strong bonds that wont be broken. Teacher notes to help make the most of this very special book can be found here. One of my all time favourite books is The one and only Ivan by Katherine Applegate and I am so excited she has a new book coming soon. Katherine’s writing is always absolute quality and so deserving of her awards, particularly the Newberry Medal. 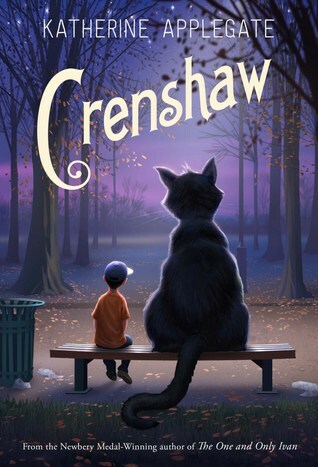 I am so looking forward to Crenshaw. Based on the blurb and reviews I just know that this book will move me just as Ivan did. Cannot wait for it to hit New Zealand shores. “Jackson and his family have fallen on hard times. There’s no more money for rent. And not much for food, either. His parents, his little sister, and their dog may have to live in their minivan. Again. 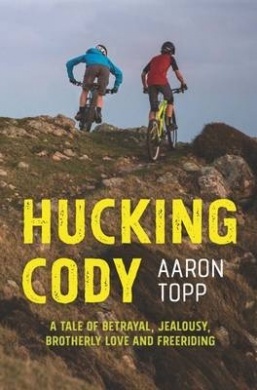 In the previous post you can see my review of the new YA novel Hucking Cody which I thoroughly enjoyed so I am delighted to have the author Aaron Topp as a guest on my blog today. I asked just a few questions so we can get to know the author a little better. Enjoy! The novel carries a sense of authority on the subject of biking. How much research did you do or does it come from your own experiences? I subscribe to the rule of ‘write what you know’ so I guess I’ve been ‘researching’ the book for the last 35 years! I received my first BMX when I was 6 and have never stopped riding a bike on dirt since. Even now at 40 years old I reckon I’m still getting faster (although my 12 year old son disagrees!) I love the whole experience of riding a bike down challenging terrain, so much like Robert Frost once said ‘no tears in the author, no tears in the reader’, when you’re passionate about something as a writer, that passion translates pretty easy to the page. Betrayal is a strong theme throughout your novel. Was this something you planned at the start or was it something that just evolved with your characters? I wanted to explore the themes of unconditional love (most often) found between brothers, and even amongst best mates. I liked the universal idea of the older brother, Zane, pioneering new ground at the expense of the younger brother, Cody, because it produced this interesting juxtaposition of ‘awe versus contempt’ within him. Does Cody accept the huckster tag his brother gave him, or has Cody got it within himself to overcome it without losing a brother along the way? What about when a mate’s involved? And the new girl Cody seems to have a special connection with – is that the same or just a reality of life? This is the journey I wanted to take the reader on. Were you keen on writing as a teenager? What is the strangest job you have ever had? I think this novel will appeal to both male and female readers and not just those into mountain biking. Did you have a reader in mind when you wrote this? While I’m stoked when any teen reads my books, just like my first book, Single Fin, I wanted to write a book that teenage males would want to read, about something they were doing in their own spare time anyway. That’s always been an objective of mine. Reading is still so important for a young man’s development, but the competition for a teenager’s attention is far greater than it ever has been. And from their feedback, I knew they didn’t always want another book about vampires, boy wizards or any of the multitude of dystopian books taking up shelf space. Real life fiction is relevant, always will be to them, although finding the right vessel of interest to carry the story is still important. What better way to do it than on a bike! How long did it take you to write – from idea to publication? I take small bites of writing due to having a day job and a young family. Having a routine is great for this and mine is a strong coffee at 7:30pm and then write at least 500 words before 10:30pm. Not exactly rock and roll, but it works for me. Over a few years Hucking Cody saw the light of day in various different forms before it finally settled on what Barbara Else calls ‘a very handsome production’. And for all those keen writers out there, what advice would you give. Read, find a routine, write when inspired, and above all else, follow your bliss. Cody’s life is good – well it is if he is on his bike, otherwise life just keeps throwing him curve balls. Tormented regularly by a group of rugby bullies Cody finds solace on his mountain bike. It gives him the freedom to soar, to defy gravity and be at one with the world. Right from the start we are on Cody’s side and as the action builds so too does our connection to Cody. He is a likable teen with good ethics which are tested as the novel moves along. He admires his older brother Zane for his bike skills and ability to outshine everyone else on the trails but at the same time he struggles with his brother’s off-the-rails antics which pull the family apart. The writing flows effortlessly making it very easy to be drawn in to Cody’s world of mountain biking. “It’s about having the ability to fly. The sensation of it, you know, defying gravity by hitting something with speed. It’s then about mixing it up, having a good time while you’re up there. Going faster and higher than before, or than other riders”. This is a quality novel for teens based in the real world where brothers sometimes mess up. While many will enjoy this novel for its insight into mountain biking, others will enjoy it for it’s realistic characters and story of betrayal. I am not the sporty type at all, in fact my idea of sports is turning the pages of a good novel and these pages I turned easily, thoroughly enjoying the story and getting to know Cody and keeping my fingers crossed as he met each new challenge. I especially like the glossary at the back of the book which explains some of the terminology of the sport. This is so exciting. I am a huge fan of the works of author and illustrator Chris Riddell. His illustrations are simply superb. Whether as black line drawings or full colour he has a way of making his characters come to life. The faces are so expressive and you can read all sorts of emotions in his pictures. His illustrations quite frankly are to be admired and appreciated for what they are and that is works of art! 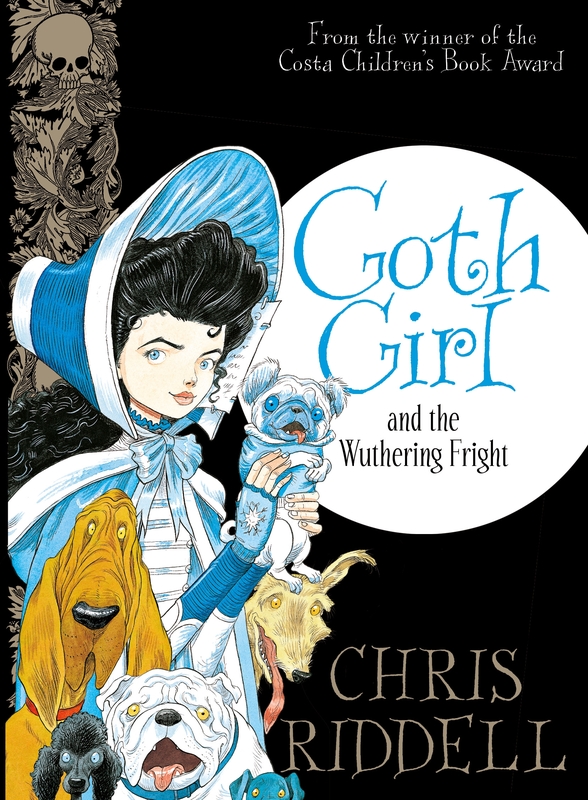 I love the humour in his first two Goth Girl books and can’t wait to add this new book to my collection. I have already pre-ordered it so hopefully it will be here any day now. It is a bit like waiting for Christmas and even a week seems so far off when waiting for this newest addition to arrive. The Goth Girl books are not only beautifully illustrated and written but beautifully packaged. Gilt edges, hardback and contain a pocket at the back of the book holding a tiny lift out book. So much thought has gone it to these books it is no wonder they are in demand. There are in the previous books, lots of tongue-in-cheek references to British literature of old and I am sure this will offer the same wonderful quirky sense of humour. Sometimes just holding a new book is enough but diving in to this one will be nothing but joy! People are flocking to Ghastly-Gorm Hall from far and wide to compete in Lord Goth’s Literary Dog Show. The esteemed judges are in place and the contestants are all ready to win. Sir Walter Splott is preparing his Lanarkshire Lurcher, Plain Austen is preening her Hampshire Hound and Homily Dickinson and her Yankee Poodle are raring to go. But there’s something strange going on at Ghastly-Gorm – mysterious footprints, howls in the night and some suspiciously chewed shoes. Can Ada, the Attic Club and their new friends the Vicarage sisters (Charlotte, Emily and Anne) work out what’s going on before the next full moon? I loved his Ottoline series too which is well worth looking out for. Chris Riddell is the very deserving current Children’s Laureate UK and you can read so much more about him here. Can’t wait! Magnus Chase and the gods of Asgard : The Sword of Summer by Rick Riordan @camphalfblood : Norse mythology coming soon. I am seriously excited about this one. I love Percy Jackson and just know that I am going to love Magnus Chase too. There is room in my heart after all, for another hero. “Magnus Chase has always been a loner, a troubled kid. Since the death of his mother, he’s lived on the streets of Boston, watching out for himself and surviving by his wits. One day, he’s tracked down by an uncle he barely knows, who tells him an impossible secret: Magnus’ father was a Norse god. After centuries apart, the Nine Worlds of Viking myth are growing closer together. The Lords of Asgard stir. Forces of evil muster for Ragnarok, and Magnus may be the only person who can prevent doomsday: by finding a weapon that has been lost since the dawn of time. Before Magnus can even process this information, a fiery attack forces him to make a fatal choice. Yes I have borrowed the blurb because I am too excited to create my own and cannot wait for the October release. I just love this trailer. Really love it! I have watched it and laughed out loud many times. I am writing this post at my desk in the school library and I have a bunch of children all giggling as they watch the trailer (again and again). The sound of children laughing is wonderful. This trailer tops the list for its humour, simplicity and charming penguins. Archie has a secret. He may be the daredevil penguin but he is afraid of the water and creatures who lurk beneath. How long can he keep his secret or will he find a way to fly high over the seas and keep out of the water. I can’t wait to see this book. Very cool!